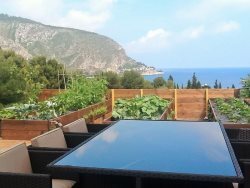 Magic Villa with stunning panoramic sea views, quiet, large terraces to enjoy, jacuzzi with a sea view, luxury dream villa to relax on the Riviera ! From the street, the steps will take you up to the main terraces, the barbecue, sun beds and the main villa's entrance. A very large living room, opening to the terrace with a sea view, dining area, fully equiped Italian designed kitchen with direct access to the terrace, and a sea view too ! Full large bathroom to enjoy. On the first floor, very specific layout : a large master bedroom with access to a large terrace, sea view of course, and a large bathroom, with shower and hot tub. Take a bath and enjoy the view ! The second bedroom is totally separated from the main house and the access can be done from the garden and lower terrace without going into the house or from the main house 1st floor back passage. Ideal for 2 couples, as the second bedroom has a sea view, but also an independent loo, a free standing large tub, and access to the terrace also. Mediterranean trees, olives, lemons, the ideal villa to relax. WIFI, large TV screen, barbecue, jacuzzi outside ! WIFI, phone, barbecue on the lower terrace, fire place in the living room, fire place in the master bedroom upstairs, jacuzzi, sauna, large terraces, sun beds, 2 outdoor dining tables, all the comfort you need. Eze sur mer is a very specific area, very quiet all seasons, but only 10 mn's drive from Monaco, and 20 mn's drive from Nice. Eze sur mer has been chosen by many because of the quiet, unique environement. On the beach, famous Anjuna beach restaurant, open from April to October is a great place to have dinner by the sea, or to enjoy day long ! Many options from Eze sur mer: Nietzsche path will take you up to Eze Village, you can drive to Nice and enjoy all the festivals, the city, the old town. Monaco has also a lot to offer. For everyday shopping, you will need to drive 5 mn's into Beaulieu sur mer, dairy market, large supermarket, bakeries, restaurants, shops.